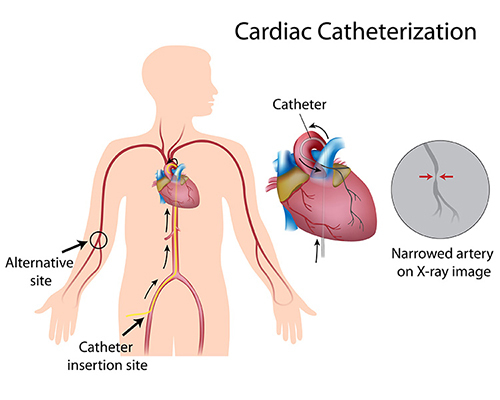 Cardiac catheterization nowadays has become very popular since coronary artery diseases are rising due to unhealthy lifestyle and stress. According to Centers for Disease Control and Prevention about 610,000 people die of heart disease in the United States every year and that’s 1 in every 4 deaths. Coronary heart disease is the most common type of heart disease, killing over 370,000 people annually. No wonder that the most common reason for admission of the patients are due to cardiac or coronary problems. Well, let’s have a sneak preview of what’s going inside the catheterization laboratory during an angiogram or angioplasty procedure is performed. Catheterization laboratory is like an operation room. It stores different equipment especially stents, catheters, and other costly kits for different procedures like angioplasty, angiogram, coiling, coronary angiography, and many others depending on the capacity of the laboratory. Angiogram is a diagnostic procedure where-in a contrast medium is injected into the arteries to see if there’s any blockage or problem in the coronary circulation of the patient. If any problem is detected in the coronary circulation, the physician will discuss to the patient the plan of care or interventions. Some patients are recommended to take medications, while others with critical condition, needs to undergo surgery or invasive procedure like angioplasty. On the other hand, angioplasty or also known as percutaneous coronary intervention, is a procedure where a balloon is used to open an artery that has become narrowed or blocked by deposits in the wall. The interventionist inserts a catheter through the groin (femoral vein) or antecubital vein, up to the site of blockage. A small metal stent is then permanently placed in the artery to help keep the artery open. It is the physician or the interventionist role to explain the procedure for coronary angiogram or angioplasty. However it is the nurses’ role to evaluate and make sure that the significant others, or the patient before the angiogram, fully understand the procedure. If the significant others and the patient still have hesitations, concerns, and questions, refer them to their attending physician. So as nurse, what is your checklist before the procedure? Secure written informed consent. Make sure to let the patient sign the consent before sedative medication is given. Routine vital signs must be obtained before the procedure. Allergies should be assessed, especially seafood, iodine, radiopaque dyes, or any drug allergy. Coronary angiogram and angioplasty are procedures that use contrast media like dye. Make sure to inform the physician if patient have allergies. The client are usually pre-medicated with antihistamines and corticosteroids to avoid allergic reactions. If patient is taking metformin, the medication is usually withheld 48 hours prior to the procedure because of the risk of lactic acidosis associated with the iodine dye. Make sure that ordered diagnostic and laboratory tests were taken before the procedure like creatinine, CBC with platelet, aPTT, Prothrombin Time, Potassium. Shave and prepare both groins with antiseptic solution, if the site for insertion will be the femoral vein. Have patient void before wheeling in to cardiac catheterization laboratory. Pre-medicate the patient before wheeling in to cardiac catheterization laboratory as ordered. Usually anti-anxiety is given before the procedure. Aspirin or Clopidogrel is also given as ordered to avoid clotting during the procedure. What are the risks and complications of angioplasty? Monitor patient’s vital signs especially the cardiac rate and rhythm using a cardiac monitor every 15 to 30 minutes for two hours. Apply a sandbag on the site for 6-8 hours or as ordered by the physician. Monitor for bleeding. Inspect the pressure dressing if soak. Notify the physician if heavy bleeding occurs. Instruct to patient to keep the extremity straight for 4-6 hours or as indicated by the physician. Maintain head of bed not more than 15 degrees. Implement complete bed rest for 6-12 hours. Enforce fluids to promote excretion of dye in the system. Do not resume administration of metformin not less than 48 hours or as indicated by the physician after the angiogram or angioplasty procedure. What will be your nursing home instructions post angioplasty or angiogram? Hematoma, bruising, and tenderness on the site is normal. These symptoms should decreases in size within 2 a two week period. The patient may have shower 24 hours after the procedure. Remove Band-Aid/dressing and wash the site with soap and water to avoid infection. Apply new Band-Aid after the shower. Do not soak in bathtubs or swimming pool for at least 7 days. Do not apply powder, creams, or lotion on the site. Regardless of the fact that you have read this article, do not disregard the protocols and guidelines for standard procedures of the hospital where you are affiliated with. Remember: always stay safe and know the grounds of your practice. Silvestri, L. (2008). Comprehensive Review for the NCLEX-RN Examination. Saunders Elsevier. 4th edition. Rina Malones is currently working as a critical care/acute stroke nurse. Besides from blogging, she's also studying International Health at University of the Philippines Open University.